Need an energy boost, I got what you need! 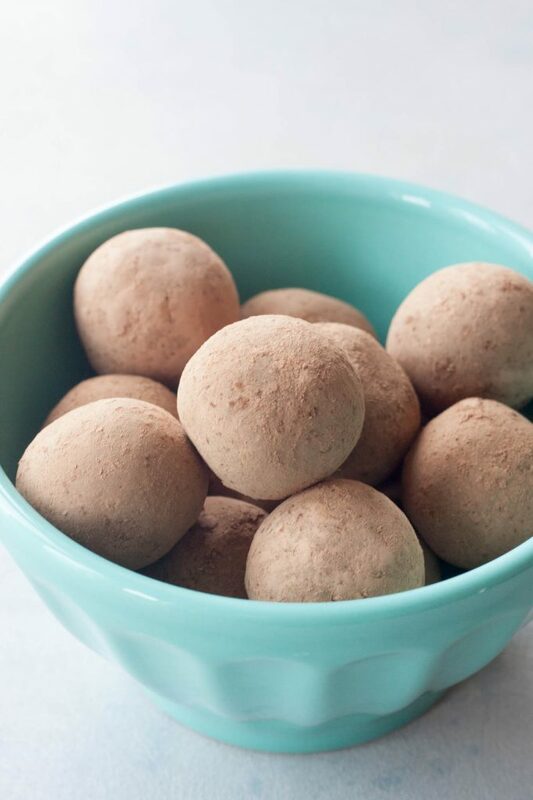 Maca Mocha Energy Bites are magical little bites that give you energy! As I stated on Friday in my Maca Coconut Mocha I need all the energy, coffee, and help I can get! Not only because I now leave for Expo West followed by an anniversary trip with my husband in only 2 days, ok less than 2 days since I leave before the sun comes up, but I’m also single mom this week. Yes the hubby is meeting me out in LA as he is already in California for work and I’m holding down the fort, doing all the mom stuff, getting the girls to school, their lunches made, driving to and from gymnastics and traveling soccer, doing laundry, making dinner, blogging, still getting in my barre because hello sunny California (I hope), getting my hair done, packing me, packing the girls and the puppies, and oh my goodness I’m tired just typing it all out and thinking about it. Yep a whole lot going on and if it snows I get to deal with cleaning up the snow and all the fun that brings. Of course the week hasn’t been going as planned and I spent yesterday in the ER getting iv fluids and meds and now I’m resting and forget the long list to do I’m just hoping I feel better before I have to board the plane. Thankfully my mother in law is able to stay with me and help with the girls and was able to take me to urgent care where I was sent next door to the ER. I’m feeling better and hope I continue to improve quickly. Still with me? Yep I need all the superfoods and superpowers! 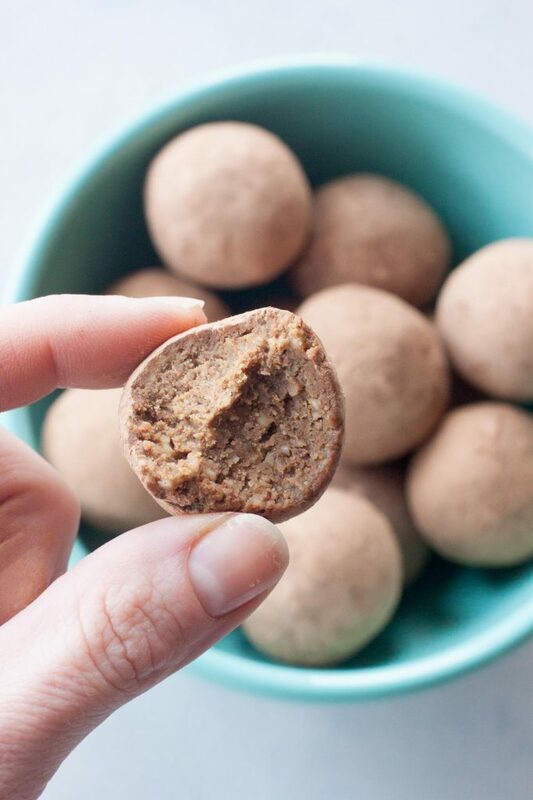 Luckily I have coffee, my Maca Coconut Mochas, and these Maca Mocha Energy Bites! One of my favorite pre workout snacks has become these magical little bites I’m popping in the afternoon for energy to get me through the day! With or without the espresso powder (ground espresso beans) they give you that boost you need! Maca as I’ve said I love it and it’s been a staple for so many years first for fertility reasons and most recently for balancing hormones, it’s adaptogenic like qualities that help my body deal with stress, and enhance stamina and energy. Cacao powder, not cocoa powder, is good for you and loaded with antioxidants and contains magnesium. I also like to add in a little of my favorite protein powder (Vega) for a protein and superfood boost! Dates, they are the super energy packed into these bites! Dates are one of my favorite pre workout snacks they are instant energy! I practically lived one summer off dates and fresh cashew butter, one of my favorite snacks. When it comes to energy my go-tos are dates, coffee, bananas, coconut oil, and maca powder. These magical, really there is no magic they’re just good, good for you, and give you energy, bites stand on their own. I snapped pictures of them and looking back I was like hmm how do people know what’s in them because I didn’t properly set up the photos but I was like they stand on their own, they are like those mystical magical things that intrigue you. Trust me they are good and will give you energy! If you aren’t a fan of coffee no worries they are good without it too and will still give you that boost of energy! Like I said I need all the help I can get with getting things done this week…. what are your tips or go-tos when you have a busy week and a million things to do? Back to Expo West! Anything you want me to track down and find or try? What are you looking for or wanting? There are so many things there and I’m all about finding the goods! Last year there were so many things I wasn’t sure what to share but luckily there is now Instagram Stories where I’m sure I’ll be sharing all the fun (as long as there are no signal issues, it’s crazy there) and I’ll be sure to have a back up battery charging pack for my phone. In a food processor pulse almonds until you have a flour consistency. Add protein powder, maca, sea salt ground espresso and pulse to combine. Add in dates and process until mixture comes together, scraping as needed. If needed add a little water, small amounts at a time up to 2 tablespoons. Roll into balls, roll balls into optional cacao powder. Place in the refrigerator, or freezer for longer storage, until ready to enjoy! Maca Mocha Energy Bites give you that boost you need before your workout or anytime. Superfood packed gluten free, vegan, and grain free bites. Send some to me please! I need energy lol! Wish I could, you’d love them and they are so great for energy! Such a great combo! Thank you, I’m finally over that and I’m hoping on the mend from my lovely surprise “injury” I got just after fighting so hard to make it out here to California. Sounds like a great afternoon snack for a quick energy boost! Yes! I love these for a pre/post workout snack or grabbing one or two to get through an afternoon slump and mom duties of getting the girls picked up and to their activities. I LOVE maca! You’ll have to give these a try I think you’d love them. Haha! I must have been, you’ll have to give these a try with or without the coffee they are amaze balls! 😉 Pop a couple of these and you won’t need that nap. 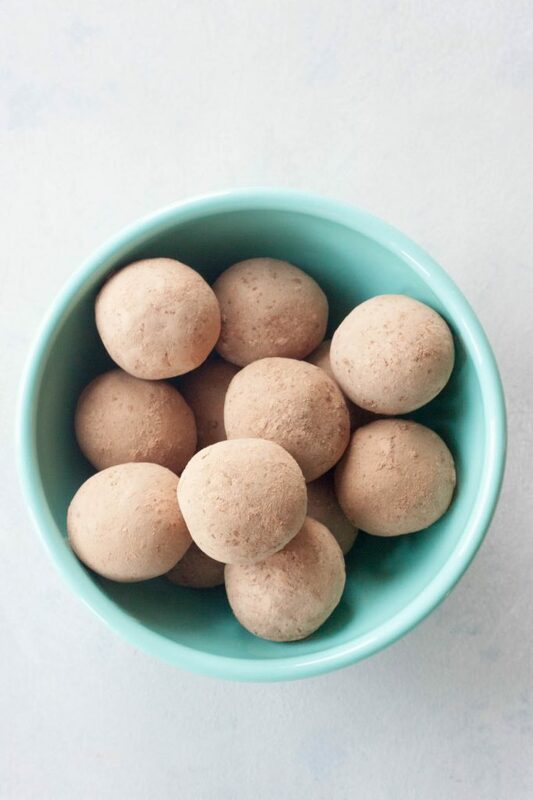 As I sit here straining to keep my eyes open, I’m thinking I’m in desperate need of some of these Maca Mocha Energy Bites! Both of my girls have been sick this week and their coughs have been keeping them (and, of course me) up most nights. Hope you are feeling better! And hope it gets better around here too! Oh no! Yes you do need some of these mama. I hope your girls are feeling better and you all got some much needed sleep. Oh no!! I’m so glad your mother in law was there to help you! I hope you are feeling better! I’m sure some nutritious snacks like these little bites will help! I’m so thankful my mother in law was here to help me, help with the girls, and take me to the hospital. I wouldn’t have made it through the week without her. I didn’t eat much and I didn’t have any of these or I would have been enjoying a few for energy for sure. Great looking recipe. I have to try these! I love maca and am always looking for new ways to sneak it into just about everything! I think you’ll love these, if you try them let me know what you think! Maca Maddness, I love it too! Oh, I hope you are feeling better! This bites look and sound amazing. I haven’t used maca powder before but would love to give it a try! Sandra Laflamme recently posted…Boston Marathon Training is Back on Track! Thank you, I finally improved and was able to make it out to California only to last 5 hours at Expo and then my body was drained and I sat down and my body just broke down but I’m hopefully on the mend now from that too. I guess I was due since I haven’t been sick (to the doctor due to illness) in 9 years. They are so good I hope you give them a try. 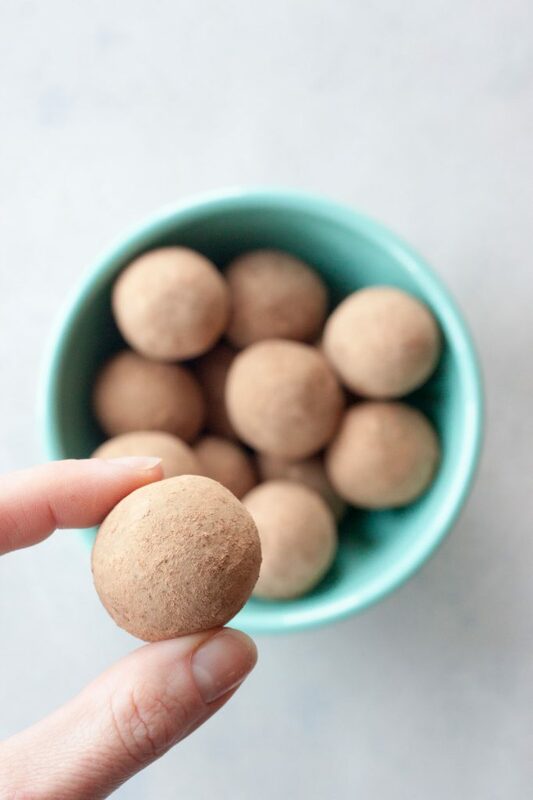 I make my kids snack balls all the time, I love the idea of one just for me! Oh these would definitely be your secret stash and help you tackle all your busy days!